It has been a long-long time since I last ate these... PEPPER BISCUITS! Ingredients are flour, pepper, sugar, groundnuts, margarine, sesame, red beancurd = YUMMY SNACKS! Coming to think of it, I have not been to Penang for quite a while now. These Pepper biscuits are being sold at Ng Kee Cake Shop in Cintra Street, Penang, very narrow lane especially when there are cars parked on both sides of the road. I remember the last time I bought these biscuits, they were packed in a box and cost around RM4.50 each. Cannot eat too much at one go! And they are so "NIB-ABLE!" Yes, I nibbled and nibbled.... Full Stop! I prefer Kampar chicken biscuit. Hint! Hint! LOL!!! I think I have eaten these biscuits a long time ago. Now teeth is not strong so cannot eat these type of hard biscuits. Very addictive snack. My old time favourite. I prefer the smaller type, size of 50 cents coin. Irene: the small ones are very hard and thick, right? Nope, but thin & cripsy. Irene, then I must try next time! Hope still got strong teeth en...hahaha. I think I've seen this biscuits before la! duno why but I didnt like to eat this biscuit since young. Maybe coz of the spices. Luckily I am not into this bisket..eheh. I thought the spices is kind of overpowering. 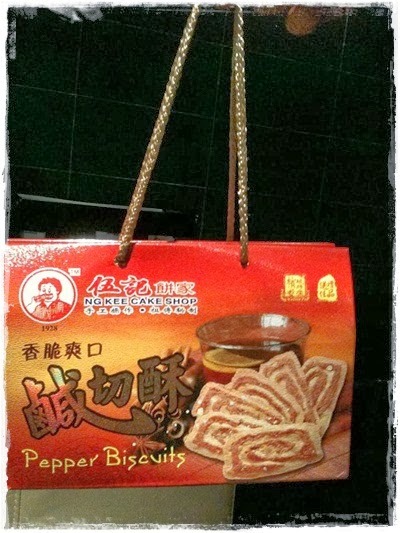 I was from Penang and have forgotten about this pepper biscuit!! i love them and thanks for reminding me. TM: next time you know what to buy, ya!